Six disciplines of KAIST have emerged among the top 20 in the world. The 2017 QS World University Rankings by Subject rated Materials Science at KAIST 13th in the global ranking. Other subjects ranked within top 20 include Chemical and Biomolecular Engineering (15th), Civil and Environmental Engineering (15th), Mechanical and Aerospace Engineering (15th), Electrical Engineering (17th), and Chemistry (18th). This year, two more disciplines advanced into the top 20 from four in 2016. QS ranked KAIST as the top science and technology research university in Korea. 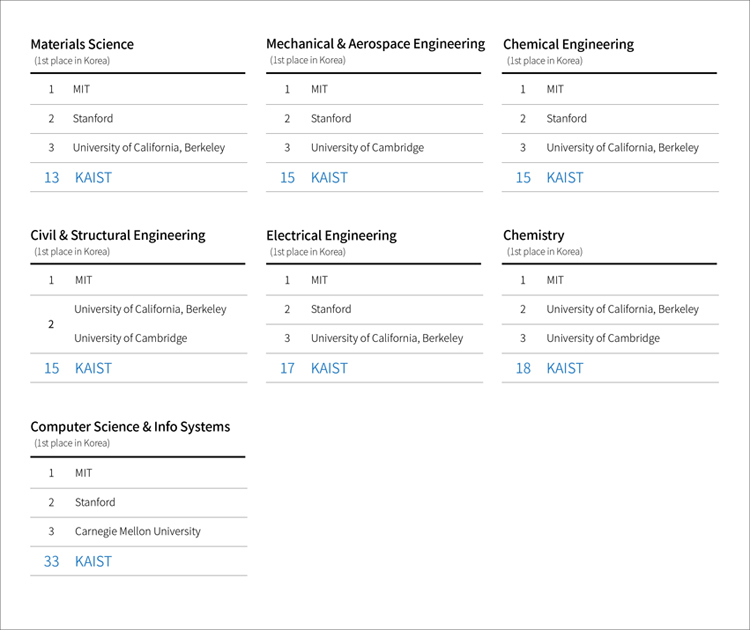 KAIST earned the highest global rankings among Korean universities in the following seven areas: Materials Science and Engineering (13th), Chemical and Biomolecular Engineering (15th), Civil and Environmental Engineering (15th), Mechanical and Aerospace Engineering (15th), Electrical Engineering (17th), Chemistry (18th), and the School of Computing (33th). In addition, two more disciplines of Physics (44th) and Mathematical Sciences (47th) were ranked second among domestic universities. The London-based university ranking by Quacquarelli Symonds, Ltd. announced the global university ranking by 46 subjects on March 8. QS rankings are based on academic reputation, employer reputation, the number of research citations, and research accomplishment index (H-index).